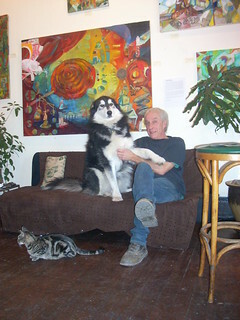 Out of the Blue Gallery, located at 106 Prospect St. in Cambridge's Area 4, has been a fixture in Cambridge for 17 years. Owned and operated by artist and musician, Tom Tipton, Out of the Blue was originally conceived as a venue for local artists to showcase their pieces. But the art gallery has evolved over time to be much more than “just” a gallery. Tom brings music, art, comedy and poetry, all together, under one roof. The gallery’s calendar is filled with events like poetry readings by Stone Soup Poetry, storytelling by a group started by local icon Brother Blue, African drum classes, comedy with Tyrone Jones and Bob Gautreau, and Friday nights are dedicated to music. Check the website calendar for current schedules or call the gallery directly at 617-354-5287. Tom Tipton along with some of the gallery's pets. If you happen to be in the vicinity, stop by and introduce yourself to the gallery owner, Tom Tipton, who is both engaging and informative. You can also meet some of the gallery’s house pets including a beautiful malamute and at least a couple of cats! Check out the video interview with gallery owner Tom Tipton.